Stuart Macrae worked for Odhams Press before World War Two editing a magazine called Armchair Science. An article that he had written on high powered magnets attracted the attention of Major (later Major General) Millis Jefferis who was establishing a team to work on sabotage devices for an Intelligence Department of the War Office known at the time as Military Intelligence Research (MIR). One thing led to another and Macrae ended up working for Jefferis becoming his 'Second-in-Command', initially as a Captain and eventually as a Colonel. Throughout the early years of the war Jefferis' team was responsible for devising numerous gadgets in support of clandestine organisations including the Auxiliary Units and SOE. Later on its talents turned to solving more conventional munitions problems. 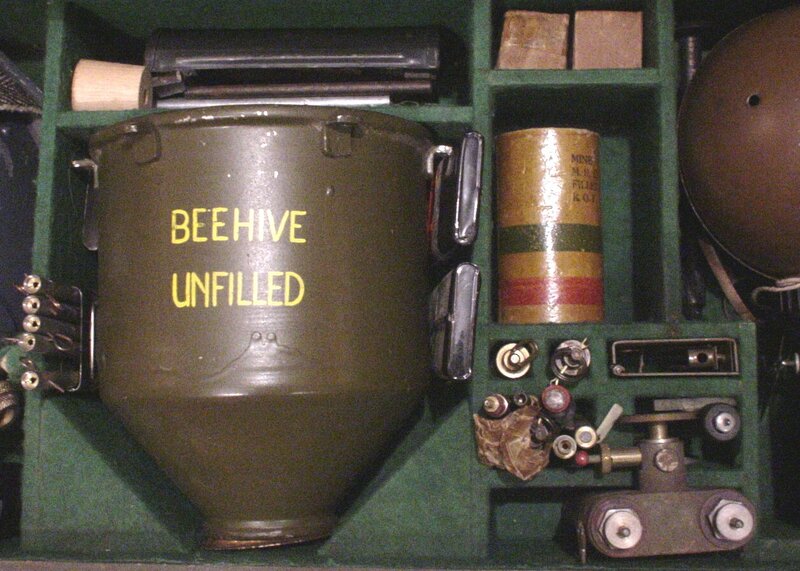 The organisation's expertise was in the employment of high explosives and the development of shaped charge and 'squash head' technologies were dominated by the department. MD1 produced Blacker's Bombard, the PIAT, Hedgehog (with DMWD), 7.5-inch AVRE, Tank Ploughs, a bridge-laying tank called the Great Eastern, a 4.5-inch Naval gun and numerous bombs. When SOE was formed in 1940 from MIR, Section D (of the SIS) and another secret organisation, the technical group of MIR was not included. Instead the team created by Jefferis and Macrae became a department of the Ministry of Defence (in fact its only department) and was known as MD1. The Minister of Defence was the Prime Minister hence the organisation became known as Winston Churchill's "toyshop". Why it did not combine with the technical division of Section D is not altogether clear but it is likely that the work on devices for the Auxiliary Units ('the British Resistance organisation') was thought to be too important to be interrupted by a merger. MD1 did work closely with the SOE technical people at Welwyn and Aston House and the altimeter switch is an example of the collaboration. By the latter stages of the war the department found itself a part of their arch rival organisation - the Armament Development Establishment - and was closed down by them soon after the war's end. A box used by Macrae in his role as travelling salesman is now in a private collection in Europe. 'The box' was used by Macrae to instruct Aux Units and other special groups and, no doubt, to promote the wares and interests of MD1 to senior officials. 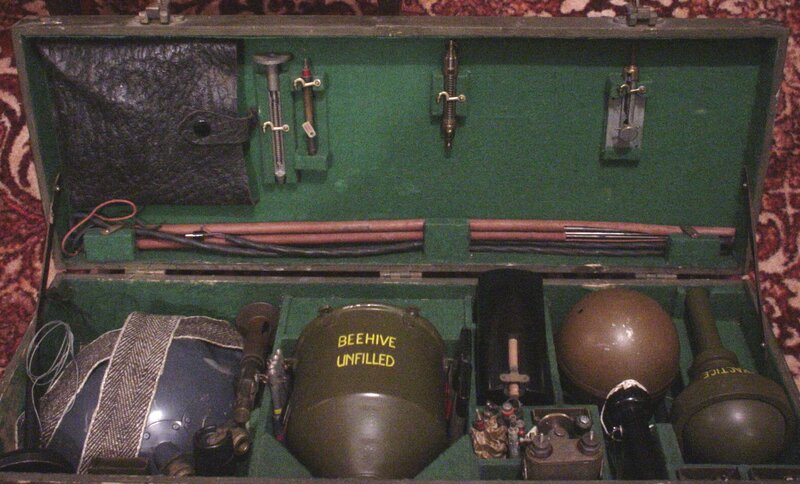 The box is a handy suitcase of devices made mostly by MD1 and consists of their leading lines for the saboteur. For completeness Macrae included two switches made by other organisations. 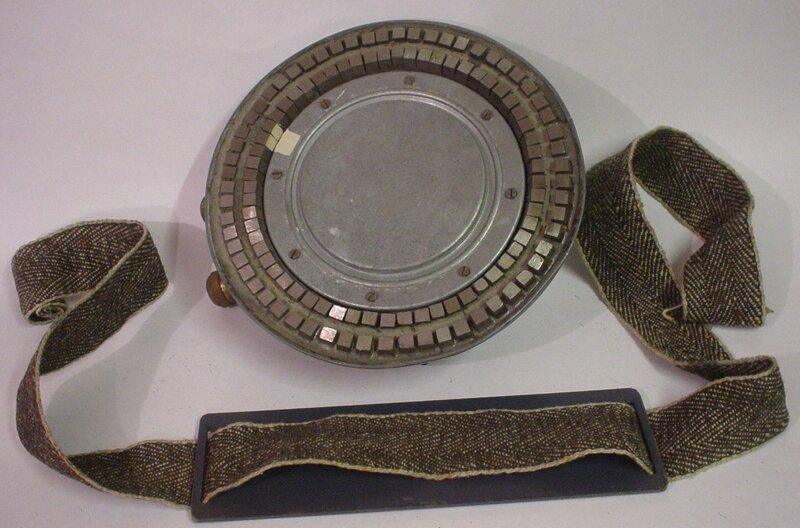 They are the No 7 electrical switch devised by RE8 and the famous No 10 time pencil switch devised by Langley of SOE. 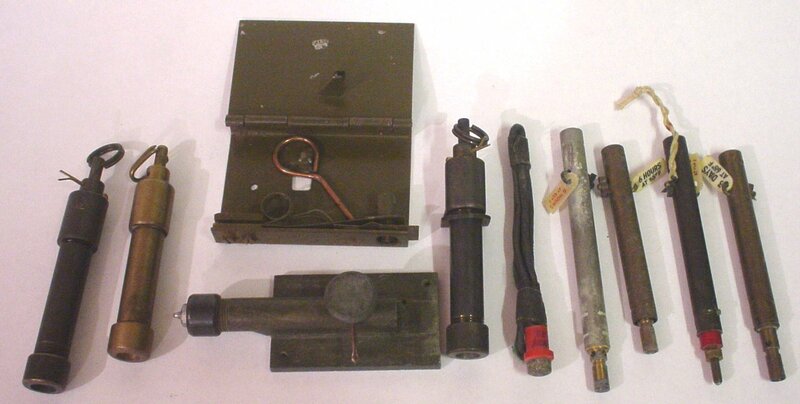 From left to right top row: fixing collar for the MD1 pull switch, a selection of 'snouts' (containing the percussion cap to fire detonators or fuze), Universal (No 13) Switch. 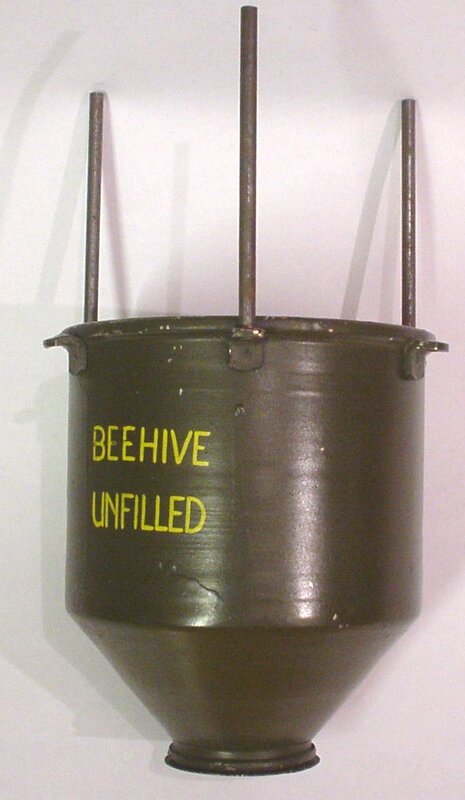 Bottom: Standoff 'legs' for beehive charge. 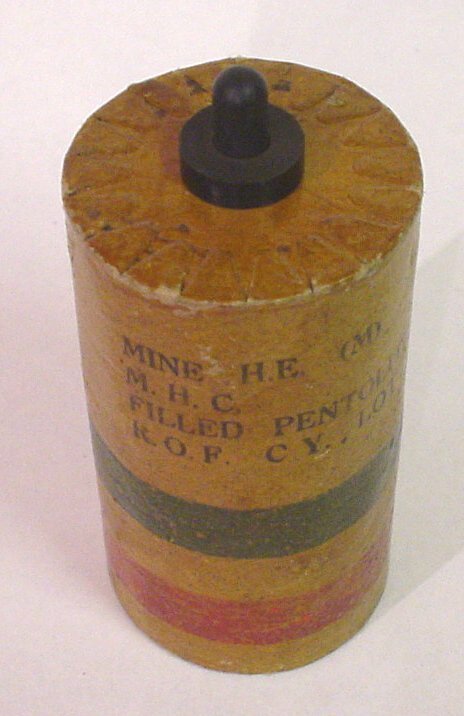 A small magnetic charge fired by an 'L' delay or by SOE's Time Pencil. 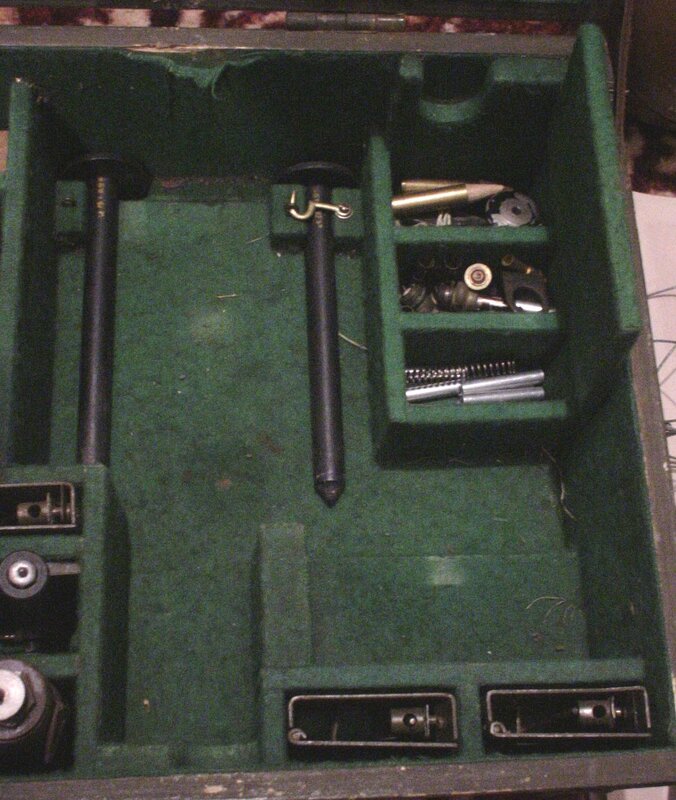 This is the second bakelite cased version with slightly more explosive capacity than previous Marks. The Mark I model was first produced (with a metal body) in September 1939. Produced in large numbers from January 1940. 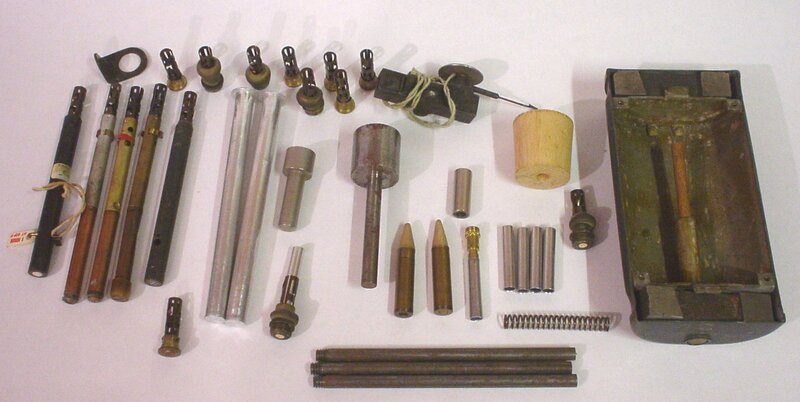 Consists of a steel tube and small mechanism firing a cartridge similar to a small arms round. Buried in the ground and operates when trodden on. A time delay switch operating by the 'creep' and fracturing of lead under tension. This model is a standard L Delay fitted with an electrical contact assembly for firing electrical detonators etc. 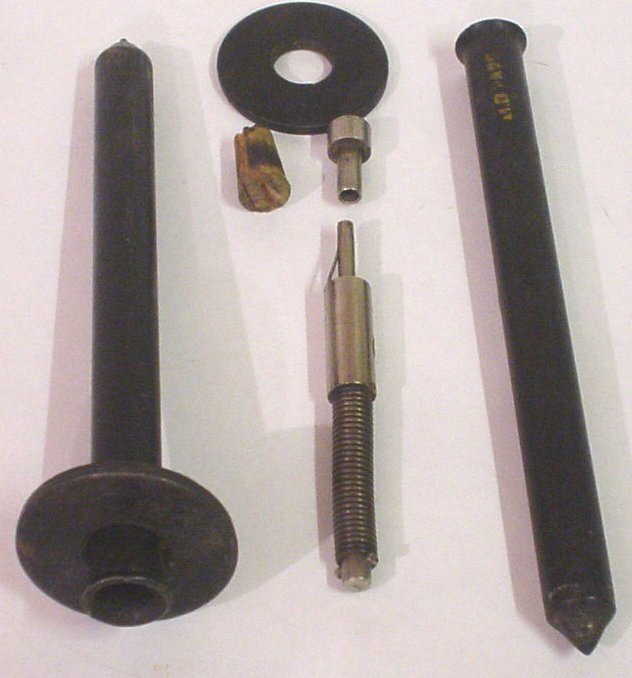 A simple mechanical device with a cocked striker, released when a retaining spigot is pulled from the switch. First produced November 1939. A cocked striker is released when a retaining bar is fractured by the pressure of the button. First produced October 1939. A small cardboard bodied mine devised by Macrae in September 1942 and put into production a month later. Functions when trodden on. 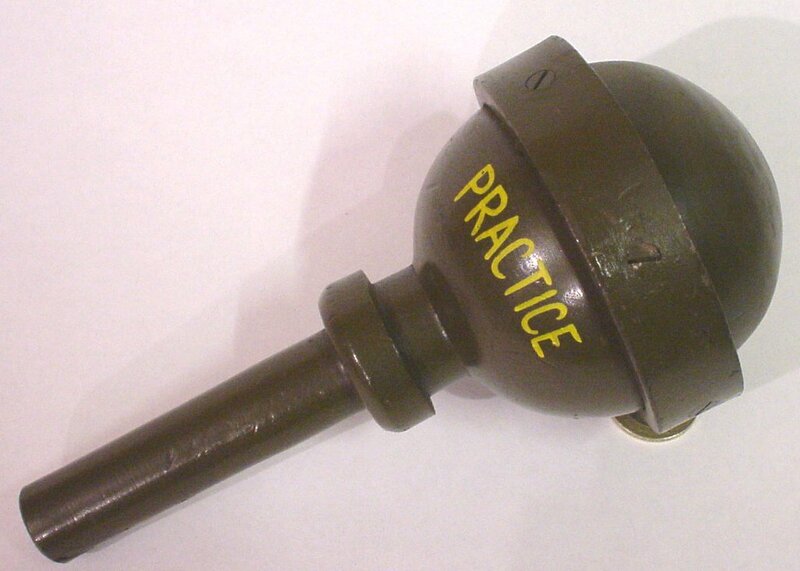 A wooden model of the Sticky Bomb weighted with an iron ring and used for throwing practice. 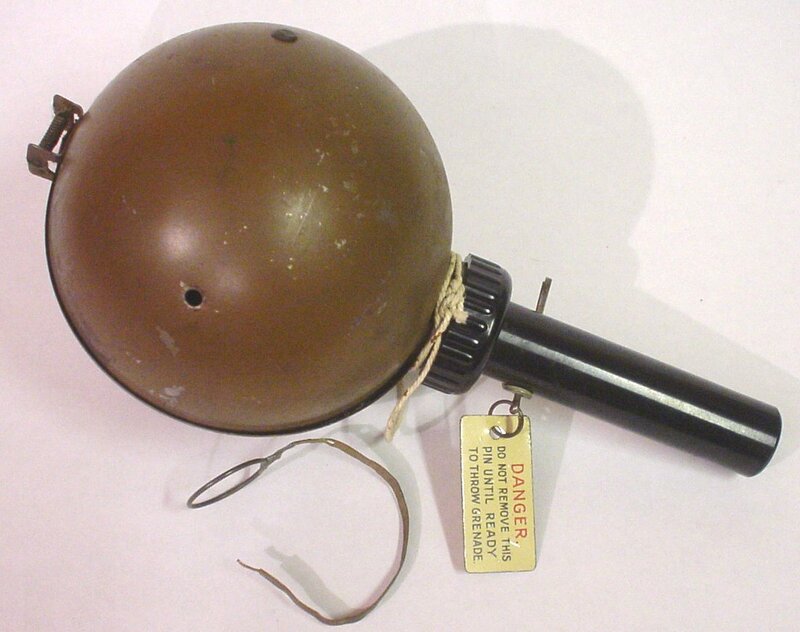 An anti-tank bomb developed from November 1939. Glass body covered in sticky material and containing a nitro-glycerine based explosive. Metal protective covers. An early poultice (or squash head) charge. Hand thrown with a 4 second fuze. Devised by Macrae in 1943 to a Far East requirement to replace the six varieties of switch then in common use. Universal switch with pull, pressure or release functions. About 30,000 made before the wear ended. The device with the red end cap is an Electrical Adaptor for the MD1 pull, pressure and release switches. 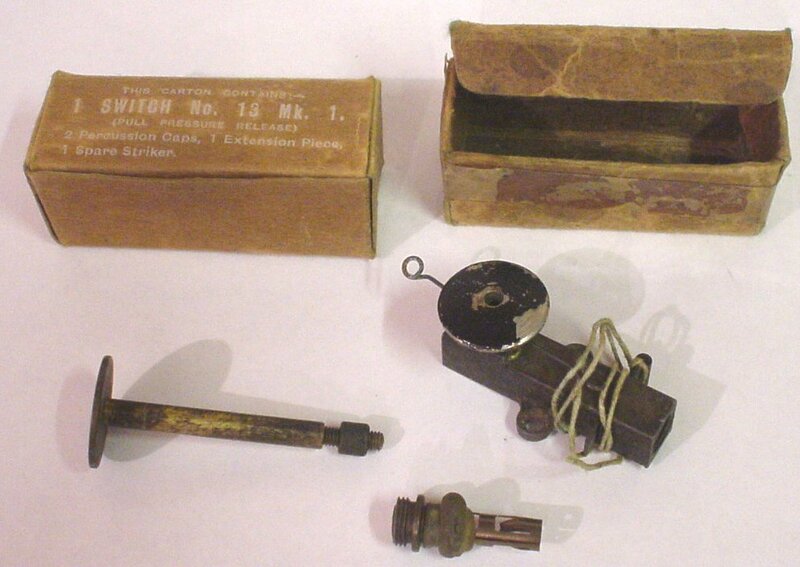 An electrical Universal switch devised under the authority of the Royal Engineers. Not successful but effectively replaced by the MD1 Universal Switch according to Macrae. 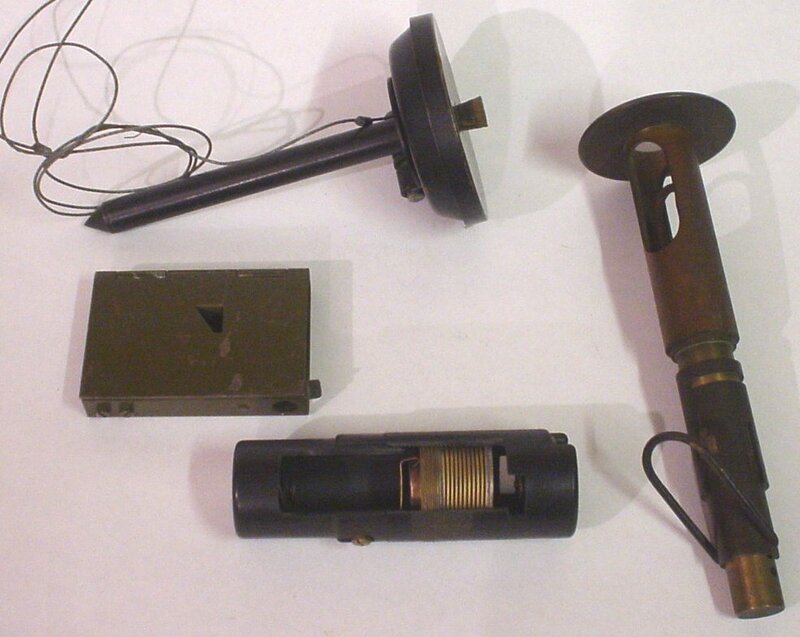 The No 12 switch is based on the Ground Spike and is fitted with an explosive charge. 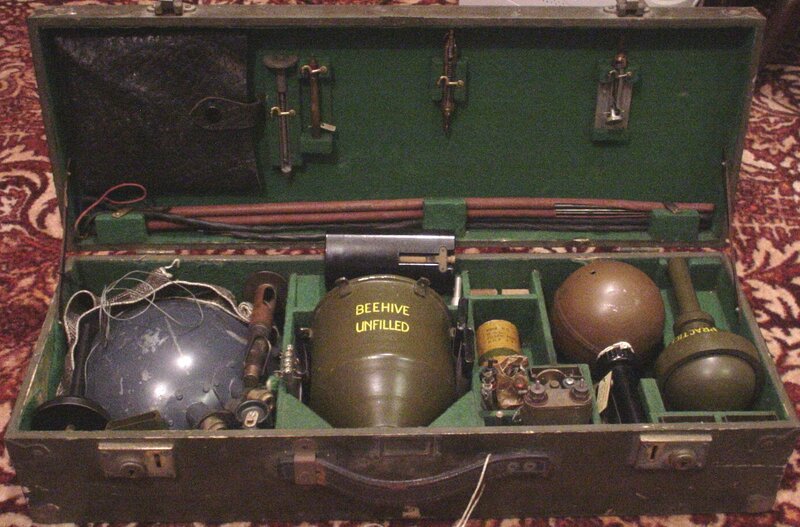 Used to protect anti-tank mines from clearance teams. 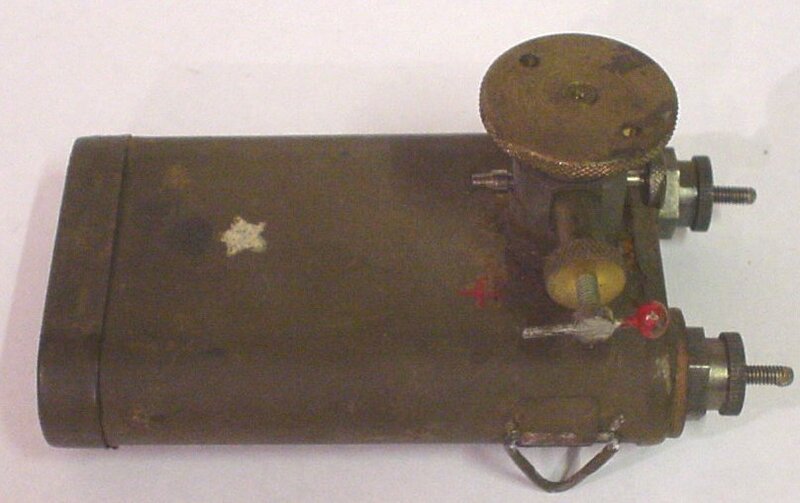 The Altimeter or Barometric Switch was produced for the SOE for the attack of aircraft. The 'J' (after Jefferis) Switch is an early pull/pressure switch. 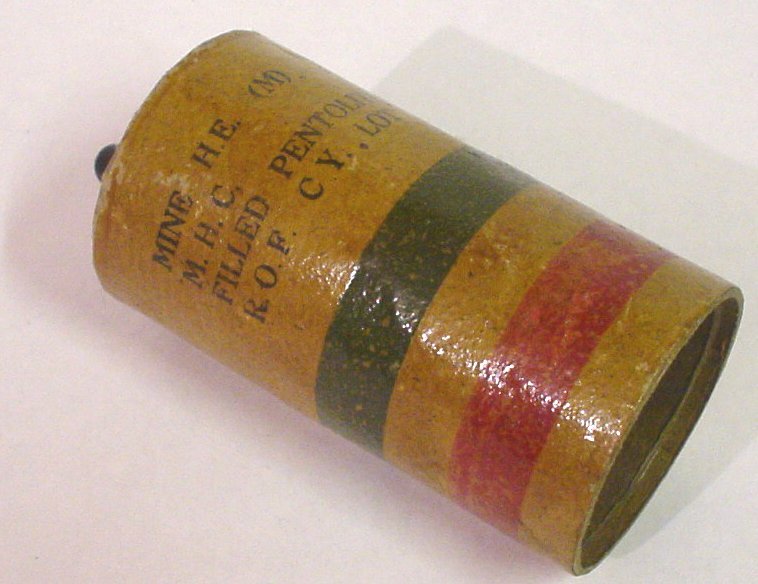 A magnetic charge for use on land or under water. 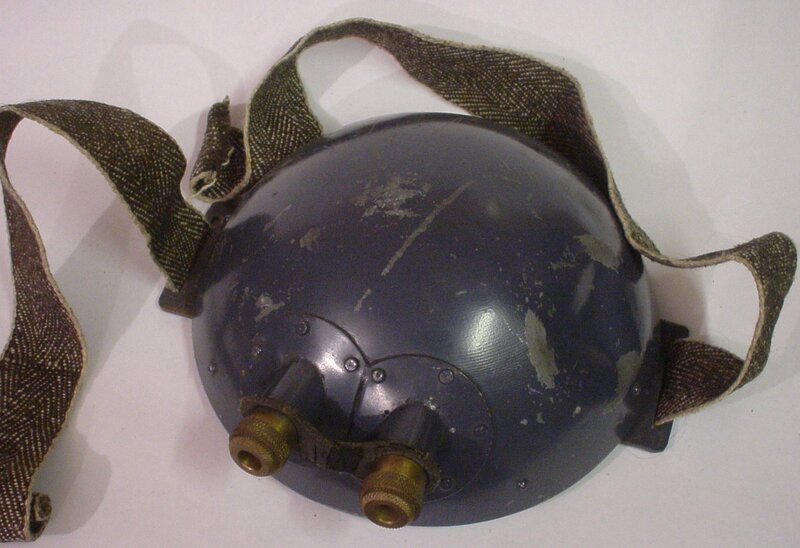 The Mark I limpet was produced from September 1939. 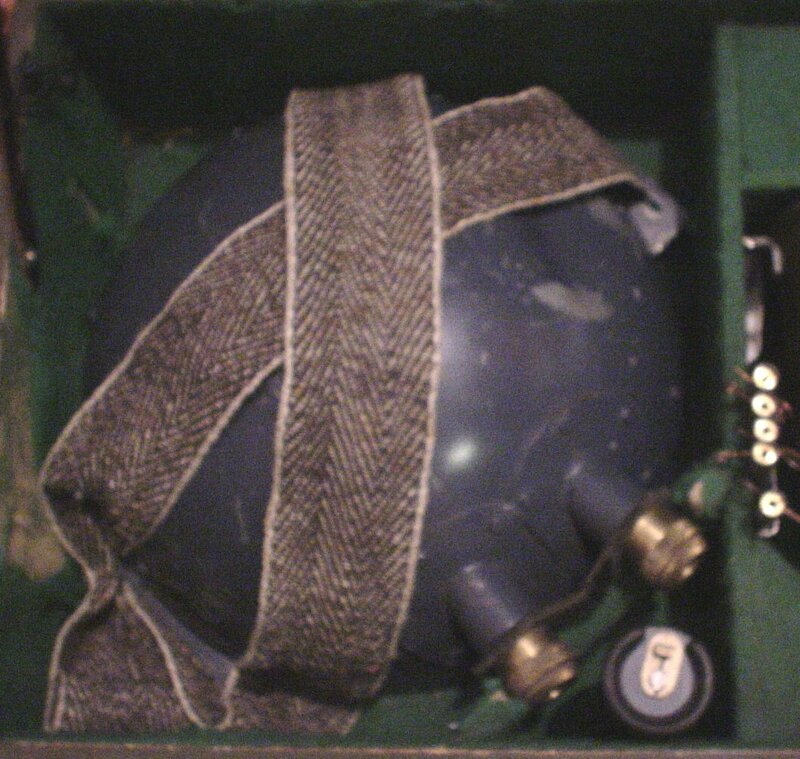 This improved model (two fuze cavities) was in production in 1941. Fired by a 'J' Delay, 'L' Delay or SOE's AC Delay. A six in diameter shaped charge demolition/sabotage device devised by Jefferis in October 1941. The reddish tube ay the bottom of the lid is a Contact Switch or Switch No 11. This is basically a piece of rubber tube fitted with two strips if metal through its length which are insulated from each other. On crushing (by a vehicle for instance) an electrical contact is made. Devised for vehicle ambushes. Thank you too the collector who allowed me to photograph this very interesting item and its contents for all of us to view for the first time. I would also like to thank Norman Bonney for helping me with the History of Stuart Macrae and the Descriptions of the contents in the box.